Peel and slice banana and put into a blender with an egg, oats, yogurt, baking powder and salt. Blend until smooth. Heat a flat pan and add a drop of oil. Scoop some pancake batter and drop slowly into the pan until small pancakes form. Bake each pancake about 2 minutes on one side, then gently flip it over on the other side and bake for another minute. Transfer baked pancakes onto a stack on a plate. 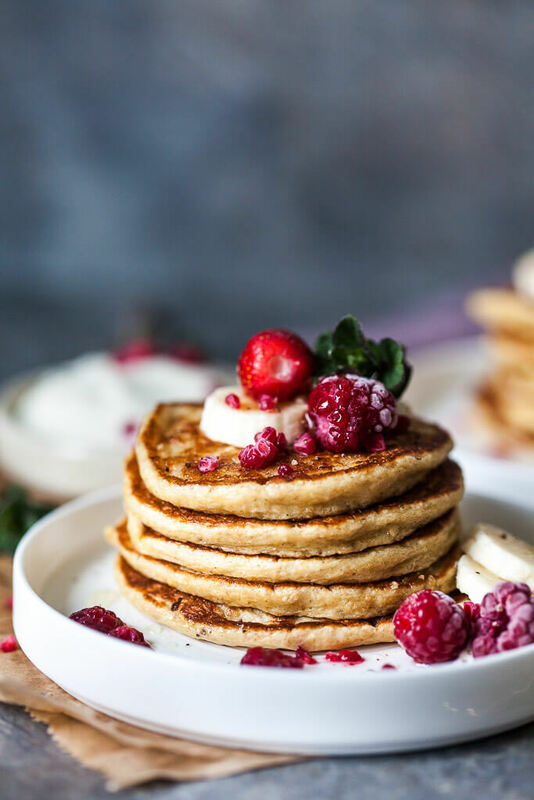 Drizle the pancake stack with some agave syrup and top with banana slices and raspberries (fresh or frozen). Serve.